It was so sunny and warm last week that I started getting prematurely excited for one of my favorite summer vegetables, zucchini. Of course, it went back to being cold this week and even snowed last night (really? ), but my zucchini craving remained. I’ve had this recipe bookmarked from Cooking Light for a long time, so this seemed like the perfect time to finally try it! Cooking Light labeled these as “chips” but when I cut them into ¼” rounds as instructed the zucchini did not get crispy, so I’m calling them rounds. You could probably cut them thinner if you want them to be chips, but I actually think I like them better this way. The Parmesan and bread crumb coating gets crispy but the zucchini on the inside remains soft and juicy. 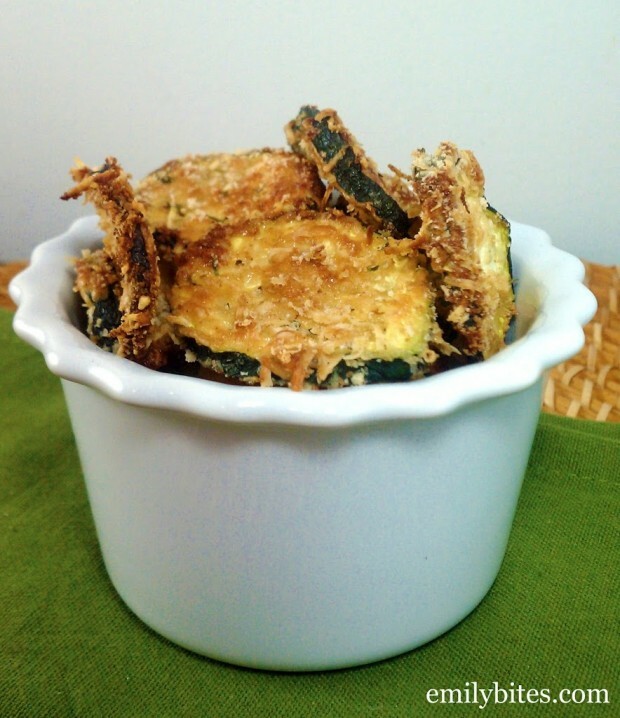 Parmesan and zucchini is such a tasty flavor combination and these rounds make a great side dish, snack or appetizer. Serve them in place of starchier side dishes like potato chips or French fries for a healthy swap! Preheat oven to 425. Line two baking sheets with aluminum foil and place a wire baking rack on top (I used two metal cooling racks).Lightly mist the racks with cooking spray. Combine the Parmesan, bread crumbs, pepper and garlic powder in a shallow dish and mix together. In a small bowl, beat the two egg whites. Dip each zucchini round in the egg whites to coat both sides and then press each side of the round into the bread crumb/Parmesan mixture. Place the coated round on the wire rack on the baking sheet. Repeat with remaining zucchini rounds. Bake for 30-35 minutes until the Parmesan and bread crumb coating is browned and crisp. Serve immediately. Thanks Dawn, let me know what you think! Hey Emily! I see you put that the points are calculated based on the recipe builder…did you put the zucchini in there too? Cos when f/v go in the recipe builder they just could it as NI and not as free f/v. I actually threw it in without the zucchini since that is “free” and it still comes up to 2 pp+…so no diff! 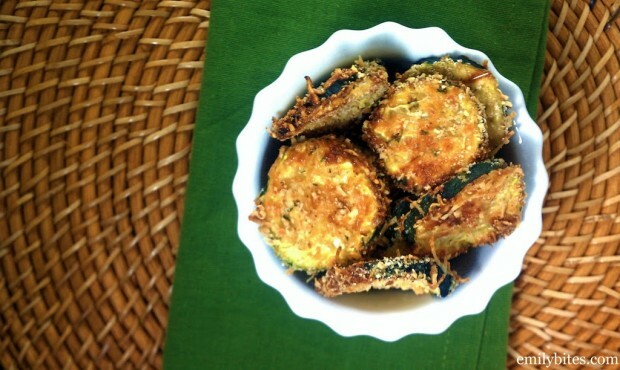 I’m contemplating going to get some zucchini today to make these…yum! How good do you think they would be reheated? You are actually supposed to count your free fruits and veggies if they are not in the original state. Once you coat them they are counted as points. Such as a piece of apple pie. You need to count those apples. At least that is what I was told in my WW meeting. this sounds really good. my question is how much is a serving??? Just had them for dinner tonight. They were fantastic. I sliced mine thin and they were crunchy like chips. Really good. I would choose these over french fries anyday. OMG EMILY!!! I made these last night and they were SO good! I made one portion while I was baking. In the time it took me to mix up this ww carrot cake…they were gone! That was pretty much dinner! Then Big Bear came home and I made another portion for him and we split that one!!! They are great! I always have trouble getting the coating to stick to things though. Had that problem when I was trying to make zucchini fries. My bread crumbs were very fine so they were done after 25 minutes (max!). Think they would get soggy if refridgerated and reheated? I want to make more! I’m so happy you both loved them! I think if you tossed them back in the oven they might reheat well. Let me know! Emily! I was going to make these for Easter, but was wondering how you thought they would be if I made them the night before. I could then take them to my parents and pop them in the oven for a few minutes to heat up. What do you think? I think they would definitely be best served the day they are made, but they’ll probably be fine reheated too. Let me know what you think! Emily, you are a goddess! Haha, these were awesome. I’ve been at my WW goal for 4 years this week, and your recipes keep things fresh, fun and delicious. Thank you, don’t ever stop blogging!! Made these for dinner tonight and they were delicious! Thanks for the recipe. So this is probably a dense question, but where can I get the baking rack? I tried to do mine on cooking sheets without the rack and they were soggy. Made these again today! They are a favorite in my house for sure! This time I didn’t have an egg so I just dipped them in water before coating and they were fine! This is a new favorite in our house! I made this today for my family for a snowy holiday week lunch! It was delicious and I loved the consistently as prepared by your recipe. This is the first time I have visited your site, and would like to know how to print off the recipes> Thank you. Thank you. I am looking forward to using your recipes. This recipe looks great, I can’t wait to try it! Loving your blog, thanks! These look awesome, was wondering if I could use panko instead of bread crumbs, keep it gluten free? Our zucchini is beginning to roll in so I made these for supper tonight. Fantastic recipe! I use panko instead of regular bread crumbs because they give that extra crunch. The biggest problem with this dish is that it’s so hard to stop eating them. This recipe is a definite keeper. Thanks for all the wonderful recipes; they really help me stay on track.